I’ve never been someone who could write things down. I’m sure I tried at least a handful of time to keep a diary as a youngster only to give up a few days into it. Something about it always felt so constrictive. If this is still so, then why am I writing a blog such as this? Well, there are a few personal reasons a few of which I mention in the About This Journey... page. However, the main reason I chose this medium called “blog” to share my journey is because of one woman who became a member of my club soon after I purchased it in 2011. Her name is Michelle and she was able to join my health club because she won a one-year membership I had donated to the Novato Mother’s Club. I remember the day Michelle walked into the club. From that first day I have witnessed her commitment to becoming healthy. She created a plan and stuck to it. It wasn’t always easy, but she was dedicated to a better life for herself. 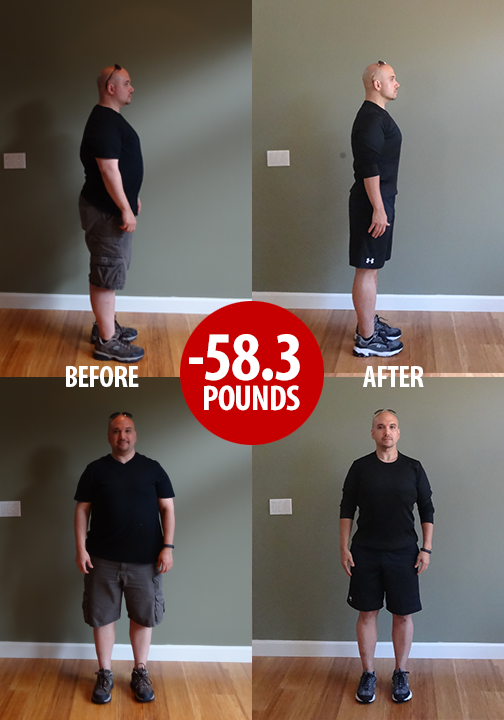 What impressed me was how Michelle documented everything relating to her weight journey; what she did, what she ate, how she felt, what exercises she did, what worked and didn’t work. She put it all out there. And the result? 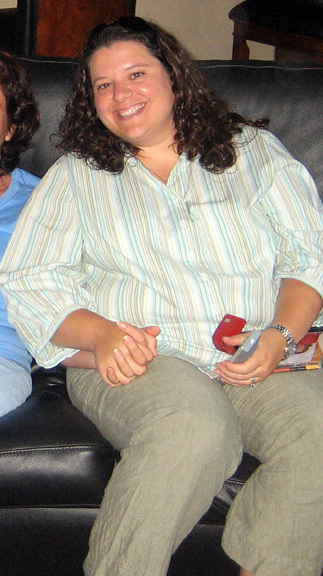 In about 16 months, Michelle was at her goal weight. In January of this year I decided to promote our club by shooting professional photos of some of our members. I was planning on having them printed as large banners and placed in our windows. I asked Michelle if she would volunteer to be photographed. She happily said yes. In my first round of shooting, I photographed about 17 of our members. As I was processing the digital film and reviewed the overall results, it was clear that I wanted…needed…Michelle to be our first “member in the window.” I had the perfect tag line too. About four weeks later I brought Michelle into my office to view her photo which was now a full-blown marketing ad for the club. I sat her down and told her to take a deep breath, close her eyes and realize that what she was about to see what the result of all her hard work. She opened her eyes, looked at her picture and read the caption, “We are in the business of creating cape free superheroes.” She was moved to tears. She kept asking out loud, “Is this me? Is this really me? 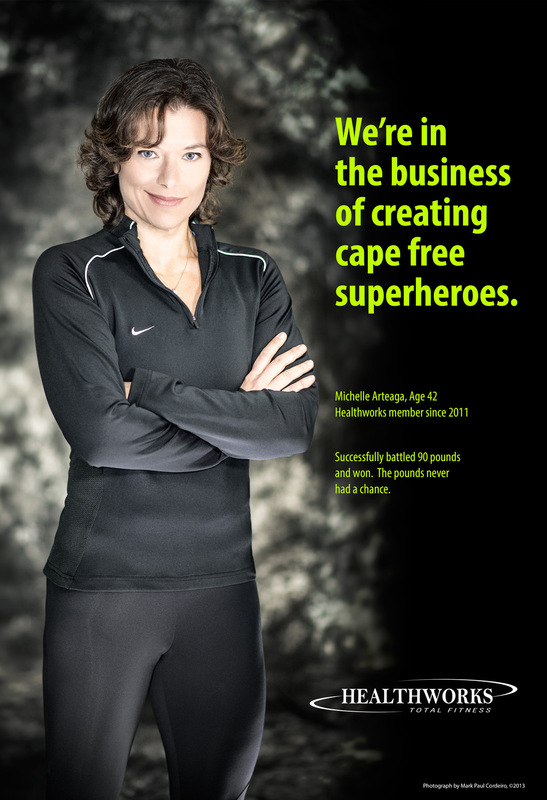 !” Read all about her experience becoming a cape free superhero on her blog. Michelle really deserved that moment and I felt honored to have been a small part in creating that. Too often we are become obsessed on the “becoming” of who we are and not what we have “become.” It’s about being present and taking a good look at the work you have done today, acknowledging your efforts, and taking pride in the small accomplishments. 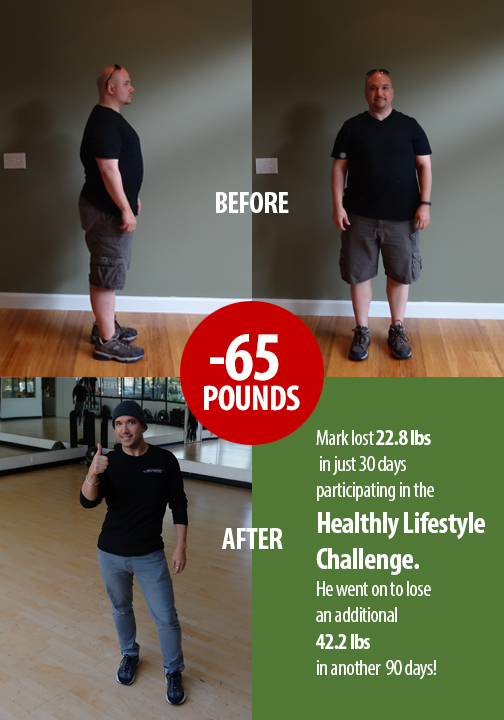 It took something for Michelle to lose her excess weight and get healthy. It took something for her to get up everyday and choose to live life fully and dynamically. As I said, she had her many challenges along the way, but she kept going…because that’s what the journey is all about. Am am inspired by Michelle’s journey and her willingness to share herself with the world. So much so, I am following in her footsteps. Here, on my blog, you will witness my journey, my ups and downs, my triumphs and tribulations. And as Michelle mentions on her blog, I, too, hope that in sharing myself I inspire others to take action in their lives. As I’m finishing this post I have a smile on my face…because I’m thinking about this time next year…maybe, just maybe there will be a new poster of Michelle hanging in the window…but she won’t be alone.